My Very First Blog: Lee Chong Wei VS Lin Dan : Who Really Won? Lee Chong Wei VS Lin Dan : Who Really Won? So it's all over. We did not win that Olympics gold medal! I almost wanted to cry. But what a fantastic match we saw on Malaysian TV that historic Sunday night. I have a new found respect for Lee Chong Wei. He really gave Lin Dan a run for his money - the fight was so close! Both exciting and nerve wrecking, it was possibly one of the best badminton matches I have seen in a long time. By the way, did you know that this match was reportedly watched by 20 percent of the world's population? Wow! Lee Chong Wei (LCW) won the first set against Lin Dan (LD) at 21-15. I was ecstatic, but somehow I knew Lin Dan would be better in the second set, as is usually the case. 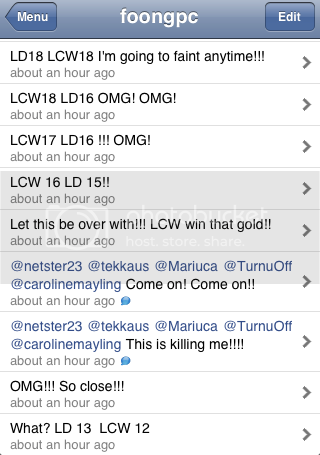 My tweets during the second game. As it turned out, my worst fear came true. Lin Dan thrashed Chong Wei 21 - 10, forcing them to a rubber set. The third game was nerve wrecking as hell. I could hardly stand the stress watching it! 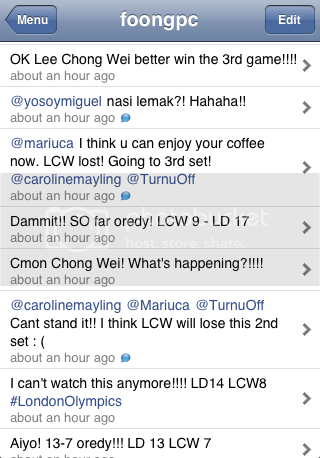 My tweets during the rubber set. The points were so close it's almost unbelievable! They leveled out at 19 - all and I was praying, hoping upon hope that Chong Wei would deliver the gold. Just 2 more points and Malaysia would have its very first Olympics gold! I felt almost dizzy! But alas, it was not to be. Lin Dan won 21 - 19. I guess every Malaysian must have been speechless at that point! 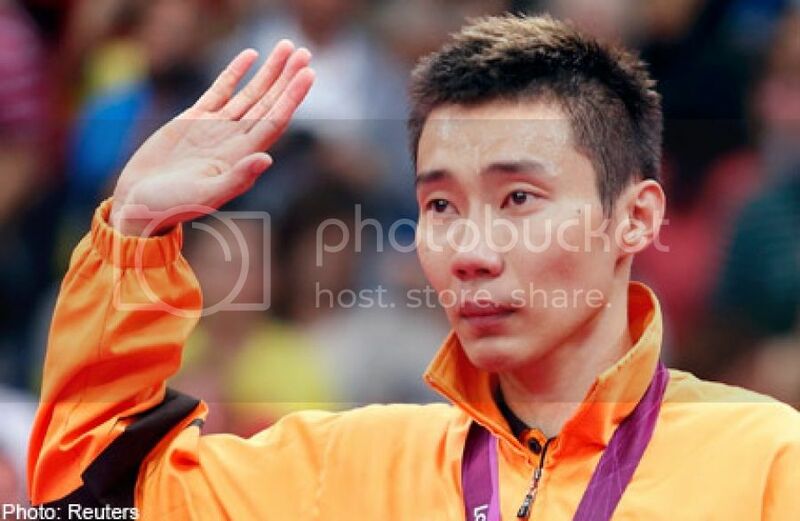 Chong Wei cried and said he was sorry for letting down the entire nation but really, he did not let us down at all. I have always thought Lin Dan had the upper hand, but this time, I could clearly see that Chong Wei was just as good as him! Even though Lin Dan has the dreaded killer smash, I thought Chong Wei was masterful at defending Lin Dan's attacks. Besides, he was pretty good at tricking Lin Dan too - surely one of the highest skills any good potential badminton player aspires to achieve! 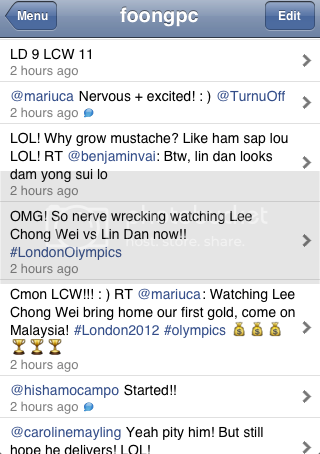 By the way, did you know that Lee Chong Wei garnered nearly half a million mentions on Twitter that Sunday? He also added close to 50,000 new followers on Twitter within 24 hours after the match! And the hashtag #ThankYouLeeChongWei peaked at No. 3 on Twitter's Worldwide Trends list after the match! Awesome! Now in my last post, I promised to give away a RM100 Jusco voucher should Lee Chong Wei win the gold. Since he did not, I'm afraid there will be no RM100 voucher to give away. However, I have decided to give away a voucher of lesser value (I shall keep the amount a secret!) to one lucky reader who commented in my last post. I have listed out all the commenters in the order that they appear below. Each of them is assigned a number. As you can see, some commented more than once, so they have more than one number. Those who are not Malaysians are not allowed to join, so I left their names out of this list. At first I thought of doing the traditional way by writing each number on a piece of paper and putting all the papers into a container and I randomly pick one up. 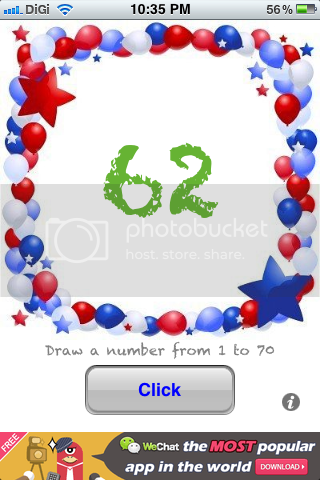 Then, I decided to use the Pick Number app on my iPhone to do the job. It looks like this. 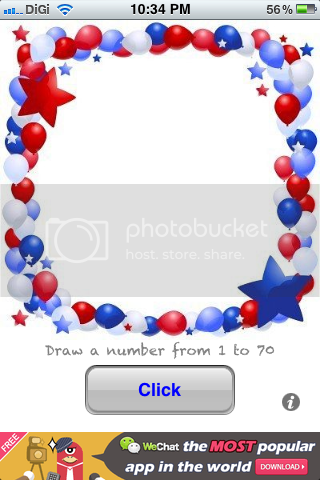 I just need to tap on that "Click" button and a random number from 1 to 70 will be selected. Just like a Lucky Draw! Of course, there are only 65 numbers in the list above, so if any number from 66 to 70 are selected, I will need to click the button again to select another number. By the way, you can adjust the range of numbers from 1 to 999, so it's pretty useful if you want to do a lucky draw for large number of people! So are you ready to see who is the winner? To end this post, let's get back to the epic Olympic match between Lee Chong Wei and Lin Dan. Some people think that Lin Dan is rather arrogant. However, I did not think he was really all that arrogant. He was, after all, the world's No. 1 badminton player. Did you know that despite the rivalry between Lee Chong Wei and Lin Dan, they are actually good friends with each other? Read HERE. An ESPN commentator said "Skills win you medals, but attitude wins hearts". How true. So even though Lee Chong Wei did not win the gold medal, he had won the hearts of every Malaysian that night. Who Is The Lucky Blogger?